At EndlessBikeGirl MTB Skills, I believe that the learning process is endless as are the possibilities! We never know everything about riding bikes and if we think we do, it’s time to hop on a different bike and learn something new! As we all know, the bike options are endless. Join me for a mountain bike or dirt jump skills session. Are you interested in learning more efficient and effective mountain bike skills? Are you coming to Pisgah or DuPont to ride but don’t want to buy maps or spend hours figuring out routes and where to ride? Would you just prefer to ride with a fun, knowledgeable guide? Do you want to increase your jumping or dropping skills? We can also head to Oskar Blues Reeb Ranch or Kolo Bike Park. I am a PMBI Level 2 certified mountain bike skills instructor and guide. I am fully insured and permitted for skills coaching and guiding in Pisgah National Forest and Dupont State Recreational Forest. I am also Wilderness First Responder and CPR certified. 1 on 1 instruction is the quickest way to increase your mtb skillset. We can work on what you want to learn if you have something specific in mind or I can come up with a lesson plan through the use of a questionaire and skills assessment. We can work one on one or you can bring some friends who either ride at a similar skill level or share similar goals. Similar to private instruction but you can bring more friends! I require a time block of at the least 4 hours so we have time to learn and apply our new skills. This is perfect for clubs or groups of friends who want to grow their mtb skillset together! Please keep in mind that I am not permitted to use Pisgah National Forest for groups of this size. WNC offers many trails in DuPont and Pisgah. The trails can put you in remote areas with rapidly changing weather conditions or a confusing array of trails, sometimes both. 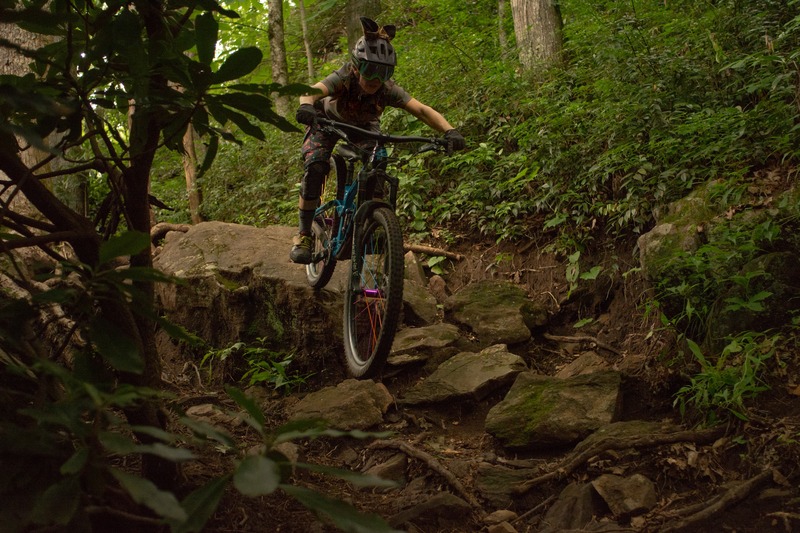 WNC definitely has a bit of trail for everyone and I would love to show you around the trail systems that have shaped me as a rider and have my heart. To check out what I’ve been up to, follow @endlessbikegirl on Instagram.